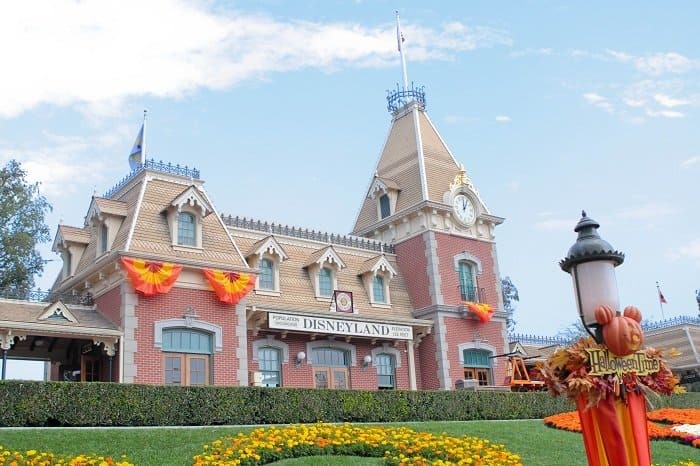 Here’s another glimpse of the front of Disneyland. Fun! These decorations line the lights of Main Street as well as the entrance area. 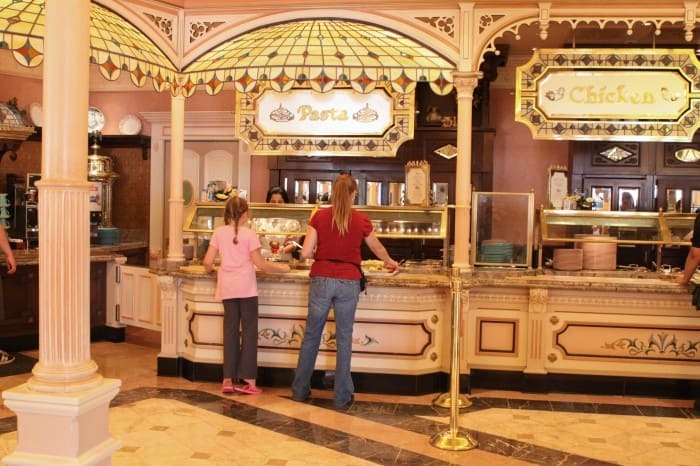 Today, I will be reviewing the Plaza Inn Restaurant right off of Main Street before heading into Fantasy Land. It has a fancy pink entrance that makes you so excited to go inside. Here’s another look of the front of the restaurant. As you walk through the entrance you will see a number of areas to choose from. You have a pasta area, chicken area, beef area and of course a dessert area. You walk right up to the counter to the type of food you are in the mood for and the server plates everything up and hands you your plate that you put onto your tray. The inside dining is very nice. 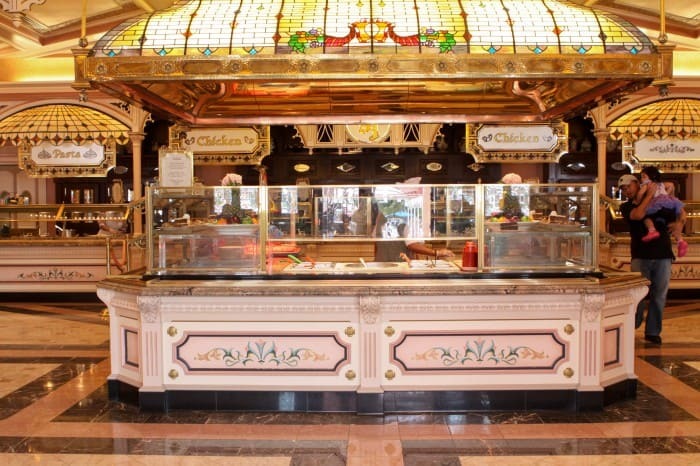 Soft decorative booths and fancy gold studded pink velvet chairs. The boys and I chose a seat by the window so I could snap some photos of our food. 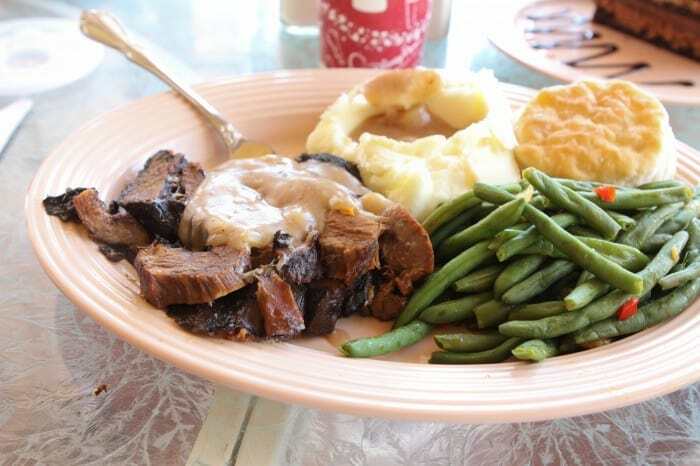 Here is the Pot Roast served with vegetables (green beans), mashed potatoes and a buttermilk biscuit. 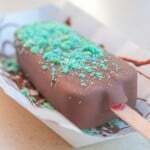 I have to be honest, when I am at Disneyland this is not the kind of food I am in the mood for, so it wouldn’t be my first choice. 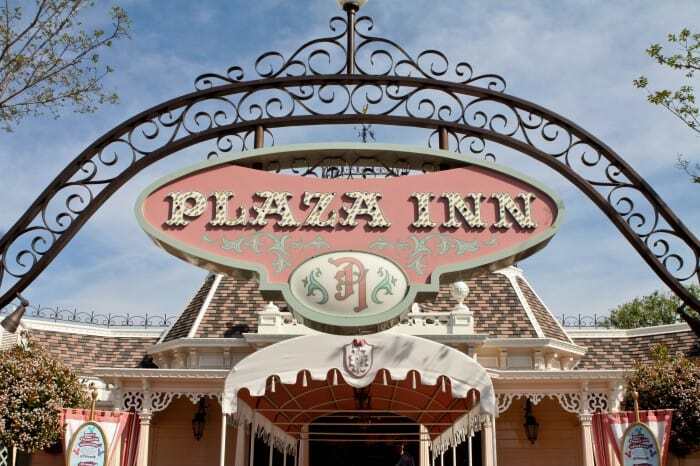 But it if you are in the mood for a hearty dinner, The Plaza Inn is your place! One of my boys ordered the Fried Chicken Leg that comes with mashed potatoes, vegetables, apples and a drink. He said the chicken was awesome 🙂 My other son ordered the penne pasta that you can choose alfredo or red sauce. It comes with a bread stick, apples and a drink. He liked his as well. You know we had to order dessert right?! Well, the chocolate cake was very nice. Layers of chocolate mouse, cake and a crunchy layer at the bottom Yum! We’ll order this one again. 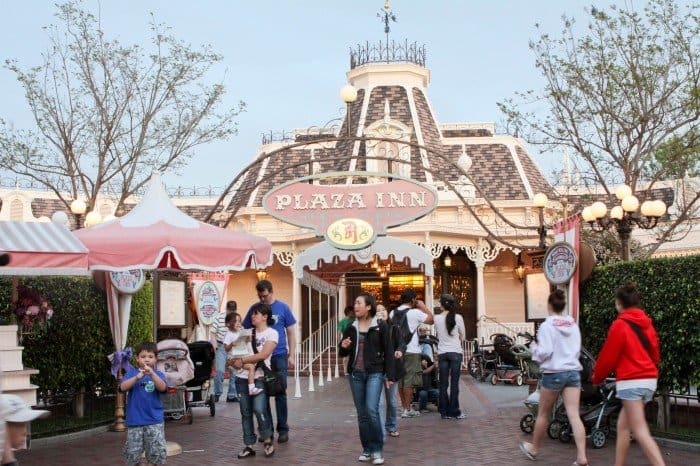 Have you been to Plaza Inn? Tell us about your experience. I’d love to hear what you loved and maybe not so loved! Oh my goodness. 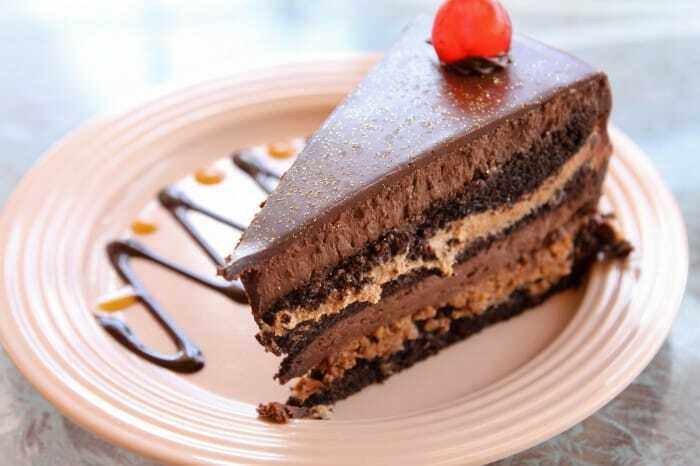 I want that chocolate cake. I looks divine!!! I loooove Disneyland this time of year! When the haunted mansion is all about Jack the Pumpkin King and his dog Zero. 🙂 Oh man, I miss having a pass. Looks like you guys had a blast! My boys and I love the Haunted Mansion!! So festive. I’ve never been to Disney – it’s not something we can afford. Are all of the restaurants that expensive? I have never ate at this restaurant but the smell of fried chicken is always enticing. I am with you, I am more into the sandwiches, burgers and corn dogs at the park. Well, Beth, I have only been to Disney World in FL once. I would say it’s probably better because it is so much bigger and all the parks are right by each other. Wish I were closer!! this is a favourite place for our family to eat! The chicken dinner is our favourite!!! 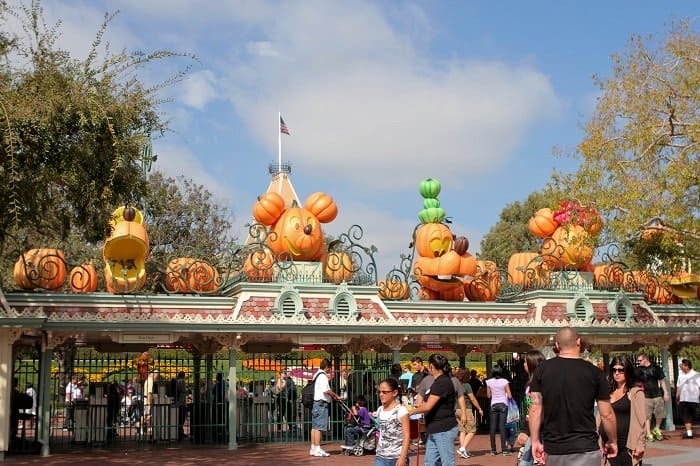 I have yet to get to Disneyland for Halloween time! next year is our plan! Looks like soo much fun!!! I’m so jealous of you being able to go so often! Keep the updates coming so I can dream!!!!! I miss having my disney pass!! 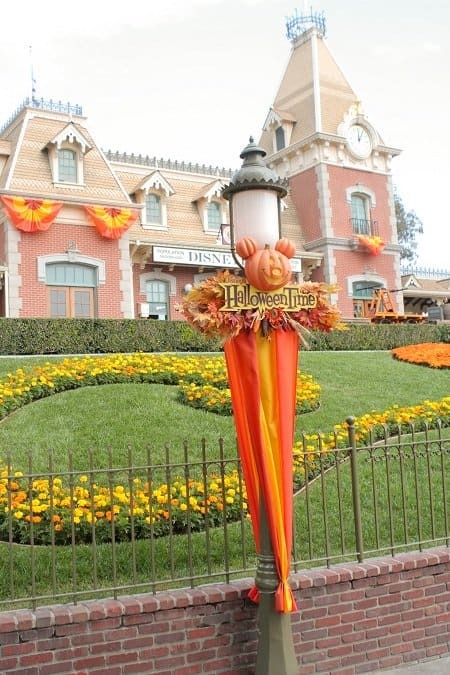 Halloween and Christmas are by far the best times to visit disneyland!! I agree Merlot. So fun and festive! That pot roast is making my stomach growl! I’m seriously drooling!!! 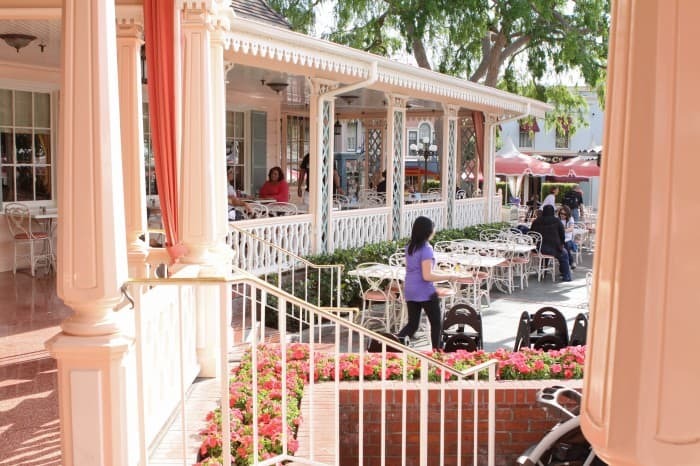 I went to Disneyland for the first time in October 2009 and LOVED the Haunted Mansion decked out in Nightmare Before Christmas style – especially when it randomly smelled like yummy gingerbread! We are AP holders from Utah. We have not tried this restaurant, mostly because it looked like a sit down/reservation place from the outside. Thanks for the peek inside, we will definitely have to try it out on our next trip! Have you tried the Big Thunder Ranch BBQ place in Frontier land? That is somewhere else we would like to try, but haven’t because our youngest son is a picky eater. 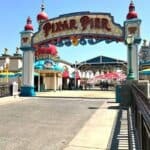 I moved away from CA and my beloved Disneyland 5 years ago when I married my best friend. (He’s worth it). 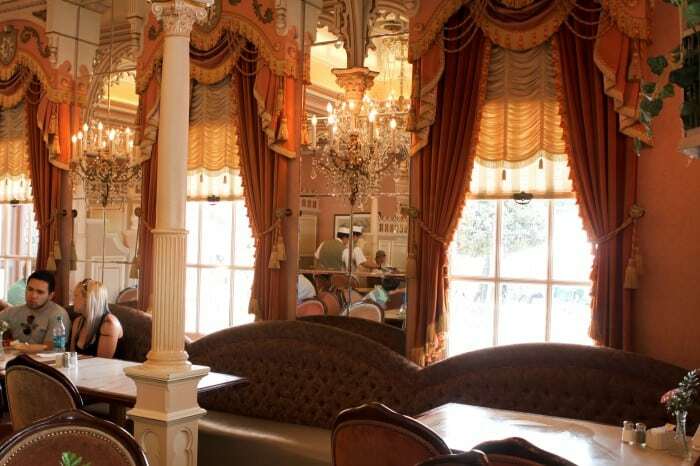 Plaza Inn is my FAVORITE restaurant at Disneyland. Their chicken is perfect and their salads and desserts? So good. 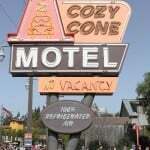 Love the Plaza Inn. 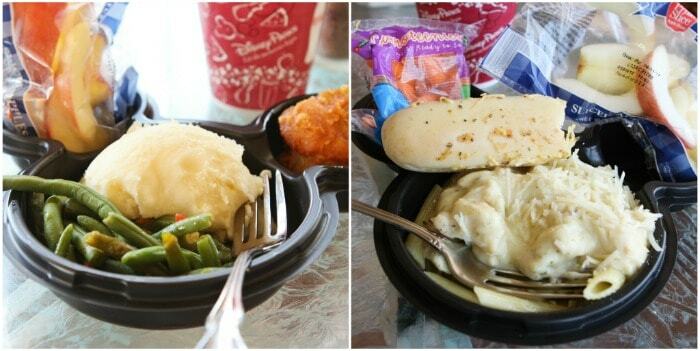 The roast beef dinner is one of my favorite meals in the park. My kids always enjoyed the spaghetti. 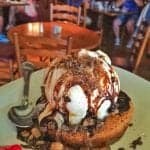 Nice salads and yummy desserts.